Fearne Cotton will deputise for Zoe Ball when she takes holidays from the Radio 2 breakfast show, with comedian Matt Lucas looking after the show on Bank Holidays. Zoe announced the news this morning, with Fearne coming in to the studio for a chat about it as well as talking about hosting Popmaster and how Fearne used to be a big fan of Live & Kicking. Fearne has been covering shows on Radio 2 since July 2016 – including looking after Graham Norton, Ken Bruce and Claudia Winkleman’s programmes. She also covered breakfast when Chris Evans was off last Easter, though in the main Chris’ cover presenters were Sara Cox or Mark Goodier. 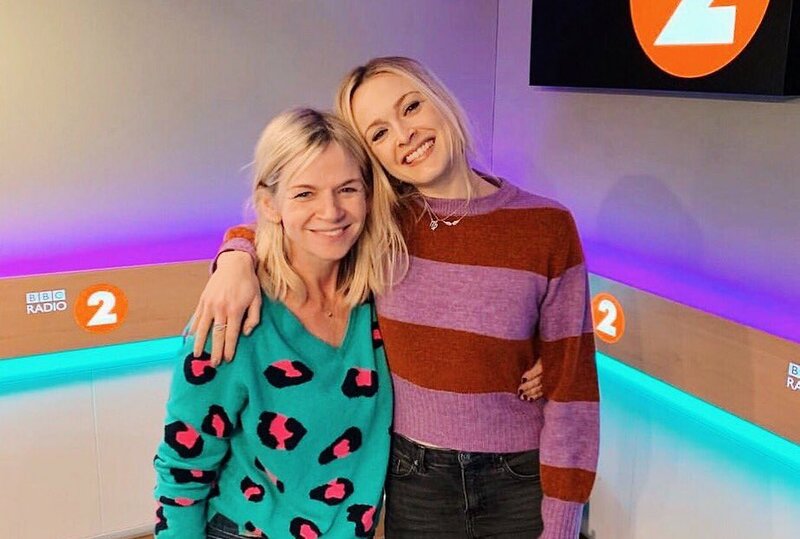 In almost 10 years at Radio 1 from September 2005 to May 2015, Fearne did Friday early breakfast, the Chart Show and weekday mid-mornings which she took over from Jo Whiley in 2009. Zoe’s first holiday from the new Radio 2 breakfast show will be in March. Matt Lucas will look after the show on Bank Holidays – he covered for Steve Wright on a Bank Holiday in May last year, and also presented Christmas with the Stars on Christmas Day 2018 on the station. Well Zoe has been on the breakfast show for a couple of weeks now so it’s obviously time to think about a holiday! It’s coming up to half-term week, and this is when presenters tend to go on their break to spend time with their family. Zoe will be off for Easter bank holiday, for sure! Sorry I didn’t realise you had to be in a job a prescribed length of time before you started planning future holidays. As you’re clearly an expert could you enlighten us as to how long we have to leave it? I think this Joe Smith meant this as a joke. You’ve left it too long. You sound far too stressed. I’d take your leave right now. I’m sure no one will notice. How unusual. The BBC has picked a woman. So I guess the rumour is now quashed about her going to Virgin too. Good luck to her and hopefully she will get a full regular show soon. Was on the fence with Zoe and her team but with Fearne coming in they may as well rename it Radio 1.Time to turn off till Ken Bruce I think. Since when has Matt Lucas been a comedian? … I did not think it could get any worse.. but it has…. The usual BBC “old girl’s network” strikes again…. and Cotton has to be the worst mistake made so far… but she will ‘fit’ as she can YAP as much as Ball. Sorry it’s not “nice” ! Yes but remember you never want a deputy who will be better than you! Obscure trendy music on radio 2 daytimes? Are you listening to the same DJs? Stuart – they do not have ANY “DJ’s” – the BBC insist they are “presenters” now ! If I did not like ‘women in radio’ why did my 80s and 90s East Midland’s stations have more than other ILR’s? And we have 2 female DJs on Solid Gold GEM AM… and not a ‘presenter’ in sight! I’m not sure the average listener cares if they can drive the desk like a “proper” DJ from the good old days. Incidentally, I wasn’t around in the 70s and early 80s but listening to old airchecks, all I hear is a lot of waffly links and cheesy jingles. So glad we’ve moved on! But I guess, as there was so little competition back then, it didn’t actually matter if the output was any good. Listen to clips of Roger Scott to learn then. Does the BBC not use the term DJ? I think they do. As for driving the desk, it may not be putting on records any more but they are still using mixing desks, and I believe all the daily shows on radio 2 do self op, except Jeremy Vine. It’s easy to tell when they’re not self opping just by listening. Think Zoe is a million times better than her predecessor and settling in well. Unfair to knock her about her holidays as I seem to recall a number of previous Radio 2 breakfast hosts were not exactly always at their desks! Which presenter are they treating badly? Which presenters are they treating badly? (Treated, past tense). All the ones that they axed/cancelled their show or moved, who listeners actually liked…eg Richard Allinson, Bob Harris, Johnnie Walker, Janice Long, Alex Lester, Sarah Kennedy, Mike Harding, Paul Jones, Mark Lamaar, Brian Matthew, Suzi Q, lots of ‘old timers’ who presented the specialist shows and Movies Dutta and Don McLean (the last two are a joke but I’m sure some listeners liked them. I know, I know things don’t stay the sane….then why on earth is Wrighty still there??? Things don’t stay sane at Radio 2. Your typo is very appropriate!